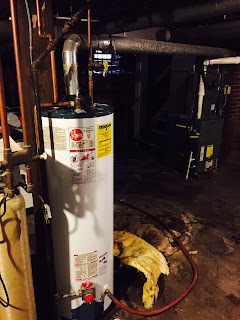 KC Water Heaters: How far can a flue run in a horizontal direction? How far can a flue run in a horizontal direction? A water heater can be one of the most dangerous appliances in your home because of the carbon monoxide that is created from the result of gas combustion. Unlike a furnace a water heater relies on warm air rising in order to safely vent CO2 outside your home. In order for the vent to work properly it's important that it's installed in accordance with code. There are several situations that we come across in which the flue has too far of a horizontal run and can result in downdraft or back draft. Not only is this unsafe for the people living inside the home it can also cause issues with your water heater causing the pilot to extinguish. The general rule for a horizontal run of the flu pipe is no more than 75% of the overall rise of the flue. If you measure from the top of the water heater all the way up to the top of the flu at its highest point you should have no more than 75% of that length for your total horizontal run. The total horizontal run may not always be visible from the basement alone at some flus will continue to run horizontal in the attic in order to vent at the desired location. The total horizontal distance of a vent plus the horizontal vent connector serving draft hood-equipped appliances shall be not greater than 75 percent of the vertical height of the vent.